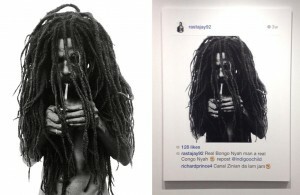 We noted last month that the copyright infringement suit against Richard Prince is moving forward. Apparently, and certainly at this stage of litigation, a few words added to an appropriated image is not enough. This doesn’t bode well for those that argue that change of context–i.e., taking a photo from a magazine and putting it within the walls of an art museum–is, per se, fair use. This entry was posted on Friday, August 18th, 2017 at 9:37 am	and is filed under Copyright, Feature. You can follow any responses to this entry through the RSS 2.0 feed. Both comments and pings are currently closed.